What’s new on the Shar-Pei front? I have not heard anything specific about the NIH (National Institute of Health) study involving FSF. The preliminary information a few months ago indicated the researchers were pretty close to identifying the genes responsible for FSF. Many thanks again to those of you who allowed blood sample for this study to be taken from your dogs. New information indicates FSF is an autoinflammatory disease and most likely represents an inflammatory response dysregulation problem — a problem involving messenger substances (cytokines, chemotactic factors), receptors, inflammatory mediators and cells involved in the inflammatory response. We are only now appreciating the complexities of the checks and balances system which controls the inflammatory response — too much inflammation damages the body and too little leaves it vulnerable to infection, neoplasia and immune- mediated disease. It may well be that the Chinese Shar-Pei will be an animal model for a new or undiscovered hereditary fever disorder in humans. A new drug will be entering the pharmaceutical pipeline soon as a potential treatment for amyloidosis. The drug, called Kiacta™ (eprodisate) is produced by Neurochem and is a new class of drugs known as GAG-mimetics. I had great hopes for this drug but results of a clinical study in people was a little disappointing. There was some favorable response but not as great as the company’s publicity indicated. West Suburban Veterinary Associates recently purchased a digital dental X-ray unit which allows us to obtain very high quality dental radiographs. This will enhance our ability to diagnose tooth root abscesses, bone loss associated with periodontal disease, etc. and help us provide better dental care for your Shar-Pei. Dental disease in dogs and cats has always been around but only in the last 10-15 years has its impact on animal health been appreciated. With this recognition has come the application of human dental procedures, techniques and therapies to the benefit of our pets. The veterinary community now recognizes a veterinary dental specialty group – the “veterinary dentists” if you will. Much of the health issues associated with poor dental health in humans directly relates to health issues in animals as well. We know that poor dental health increases the bacterial load on the body and can result in bacterial heart, kidney and liver infections. There certainly is the pain aspect of dental disease and animals do feel pain but don’t have the ability to do much about it unlike humans. Loose and broken teeth, bacterial oral cavity infections, weakening of the jaw bone, draining tracts in mouth due to root abscesses, difficulty in picking up food and chewing can all be the result of dental disease. As you can see (and smell!) bad breath is just the tip of the iceberg when it comes to evaluating your Shar-Pei’s dental condition. There is a breed predisposition to IgA deficiency/insufficiency. IgA is an immunoglobulin that is found in high concentrations in secretions such as mucous, saliva, tears, etc. It functions in decreasing bacterial levels/invasion on mucosal surfaces of the oral cavity, gastrointestinal tract, urogenital tract, and the eyes. The IgA problem in many Shar-Pei may enhance bacterial survival in the periodontal pockets around the teeth promoting periodontal disease. “Tight lip” syndrome which primarily involves the mandibular (lower) incisors and canine teeth can trap food debris, and hair in the “mandibular vestibule (the space between the lower front teeth and the lip). The Shar-Pei has a fairly tight “vestibule” which is the space between the teeth and lips around the entire oral cavity (as anyone who tries to pill a Shar-Pei knows). This traps food, hair, debris and saliva around the teeth and gums with resultant periodontal disease. You’re aware of this if you ever pill a Shar-Pei and they spit the pill out ½ hour later. With the heavy lips in the breed caused by excessive hyaluronan (mucin) deposition in the subcutaneous tissue it is not easy to brush the teeth due to lack of room. Shar-Pei also seem to have a predisposition to lip fold infections (pyoderma) which can augment bacterial load in the mouth. Periodontal disease is a common problem in all dogs but more so in Shar-Pei due to some of the aforementioned anatomical considerations. What is periodontal disease? 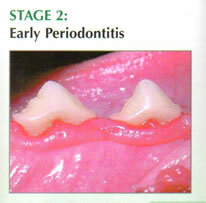 Periodontal disease is really a progressive deterioration of the teeth and associated structures over time. It begins with periodontitis which is inflammation of some or all of the tooth’s support structures – the gingiva (gums), periodontal ligaments which hold the tooth in the bony socket (alveolus), the alveolar bone itself and, in advanced cases, even the bone of the jaws. We know that dental health is dependent on normal host defense mechanisms to prevent or limit the penetration of bacteria or their products into the body through the oral tissues. These mechanisms include salivation, swallowing, tongue action on the teeth and inside of the oral cavity, proper diet, intact mucous membranes in the mouth, IgA levels in the saliva and a healthy immune system. When these mechanisms aren’t adequate for whatever reason bacteria adhere to the surface of the teeth and accumulate in the gingival space at the base of the tooth. The result is plaque which becomes mineralized and transforms into calculus. Ultimately, oxygen depletion occurs, anaerobic bacteria take over and their products result in inflammation, tissue destruction and periodontitis. Risk factors for periodontitis include: self-grooming (hair becomes embedded in the gingival space), concurrent debilitating diseases and poor nutrition. 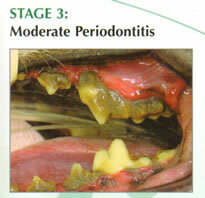 I’ve heard statistics that most dogs over 3 years old have some form of periodontal disease. 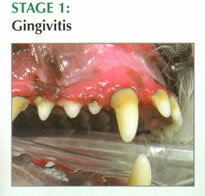 Stage 1 – This stage is gingivitis only without attachment loss. Gingivitis can be seen grossly as increased redness of the gum along the base of the teeth. Stage 2 – At this stage there is less than 25 percent loss of attachment. Attachment loss is the combination of the periodontal pocket depth and measurement of root exposure. Pocket depth is determined by using a periodontal probe to measure the gingival sulcus at the base of the tooth. This usually has to be done under anesthesia in animals. 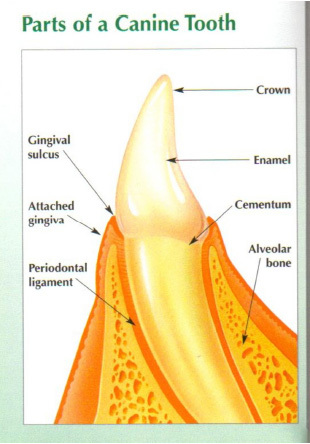 Stage 3 – Here there is a 25-50 percent loss of attachment to the alveolar bone. Usually root exposure is beginning to become evident. 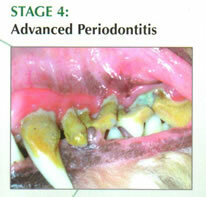 Stage 4 – This stage is advanced periodontitis and there is greater than 50 percent loss of attachment. Here there is significant root exposure, loosening of teeth and purulent (pus) buildup around the roots as well. One of the major diagnostic tools used in evaluating periodontal disease is dental radiography. This allows us to visualize the alveolar bone (the root socket), measure and document bone loss for comparison purposes later on. At West Suburban Veterinary Associates we have the ability to take digital dental X-rays giving superior quality record tracking – many human dentists do not have this technology yet. Additional diagnostics consist of periodontal probing as was previously mentioned. While a dental examination can be conducted in the exam room during a routine physical exam it is better done under anesthesia while doing a dental prophylaxis procedure. The dental prophylaxis includes charting the teeth, probing the periodontal pockets, an ultrasonic teeth cleaning and polishing. The goal is to control plaque and slow down the progression of periodontal disease. Additional periodontal procedures may be necessary in many dogs and consist of dental radiographs to evaluate tooth roots and alveolar bone health, root planing, extracting loose teeth or those with excessive root exposure and therapy such as placement of local antibiotic gels into the periodontal pocket. Often systemic antibiotics and pain medications are given before and after dental procedures. We are very fortunate at our hospital to have certified veterinary technicians do most of the dental procedures and who update their skills via continuing education courses on a regular basis. The most effective home care is tooth brushing and I will be honest — it is also the most labor intensive. I usually start brushing using a gauze pad or short strip of roll gauze wrapped around my finger. Pet toothpaste is put on the gauze and I scrub the teeth with the gauze. Dogs seem to know not to chew on the owner’s finger and train to the program pretty well. Often then a tooth brush can be incorporated to do the brushing later on. Daily brushing is best but whatever you can do is better than nothing. Other products such as sprays, washes, toys, dental treats and foods are useful but do not replace brushing. I’d like to make a comment about anesthesia and veterinary dentistry. Many owners are nervous about putting their pets under anesthesia to do dental procedures. The use of gas (inhalant) anesthetics has greatly increased the safety of anesthesia. At West Suburban Veterinary Associates we use sevoflurane gas anesthesia which is very safe, we have anesthetic monitoring equipment which continuously monitors blood pressure, respiratory rate, heart rate, end-tidal CO2 levels, an electrocardiogram and pulse oximetry (blood O2 levels), the animals lay on warm water heating blankets and we have very good technicians who continuously monitor our dental patients as well. We often utilize intravenous fluids to help maintain blood pressure and to have ready venous access for drug administration if needed. Lastly, a new technology has recently been introduced in the veterinary dental field, Porphyromonas Denticanis- Gulae-Salivosa Bacterin, a canine vaccine that prevents canine periodontitis. This vaccine targets the most common periodontopathogens found in dogs, anaerobic bacteria which colonize the periodontal pockets, plaque and calculus. I think this vaccine will prove to valuable in those dogs with frequent/severe periodontal disease. We’re primarily concerned about having a clean mouth with as little dental disease as possible. For endodontic treatment such as root canals, fillings, orthodontics, caps and so on we can refer you to a veterinary dental specialist. For basic dental care we have the equipment and expertise to do a good job for your Shar -Pei here at West Suburban Veterinary Associates.